The FBI may have violated five federal criminal statutes and its own operations guide by using an unverified, Democrat-funded anti-Trump dossier in a court application for a warrant to surveil an associate of President Donald Trump, according to a letter from Rep. Devin Nunes to Attorney General Jeff Sessions. FISA stands for Foreign Intelligence Surveillance Act, a U.S. law that allows for the surveillance of U.S. citizens after obtaining a strictly vetted warrant through a secret court. 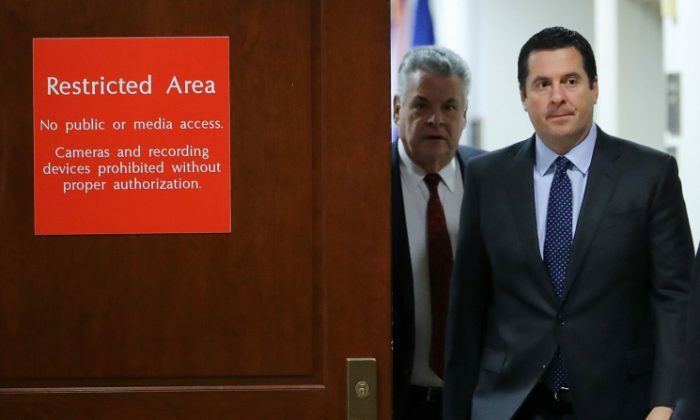 Nunes noted that in addition to violating internal protocols, senior officials may have broken criminal statutes by presenting unverified or false information to the surveillance court. The potential criminal charges include conspiracy, obstruction of justice, and contempt of court. The letter also cited a statute which makes it a crime to willfully deprive a person of a constitutional protection and another which prohibits unauthorized electronic surveillance. The findings cited in the letter were first made public when Trump declassified a bombshell four-page memo composed by Republicans on the intelligence committee. Among a range of alarming revelations, the memo showed that the FBI would not have applied for a surveillance warrant without the unverified anti-Trump dossier, that senior officials involved in the warrant process knew of the dossier’s political origins, and that the dossier’s author, Steele, betrayed his bias against Trump. Nunes asked Sessions if the FBI’s rules for applying to the surveillance courts have changed since the internal guide was last updated in 2011 and if the new rules allow for the use of unverified information. The potential criminal charges include conspiracy, obstruction of justice, and contempt of court. “If not, what steps has the DOJ and/or the FBI taken to hold accountable those officials who violated these protocols?” Nunes asks in the letter. Weeks after the Republican memo was declassified by Trump, the Democrats on the intelligence committee released their own memo meant to counter the Republican findings. The rebuttal memo attempts to challenge the fact that the anti-Trump dossier was unverified. But in his testimony to the Senate Intelligence Committee in June last year, then-FBI Director James Comey told lawmakers that he considered the dossier “salacious” and “unverified” approximately nine months after the warrant to surveil Page was first obtained in October 2016. On Monday, Trump questioned why the Obama administration launched an investigation of him during the 2016 presidential campaign.